Let’s make a toast! The liquid in the glass is sake. Kampai Toronto – Festival of Sake, organized by The Sake Institute of Ontario (SIO), is held in Toronto’s Distillery District every summer. 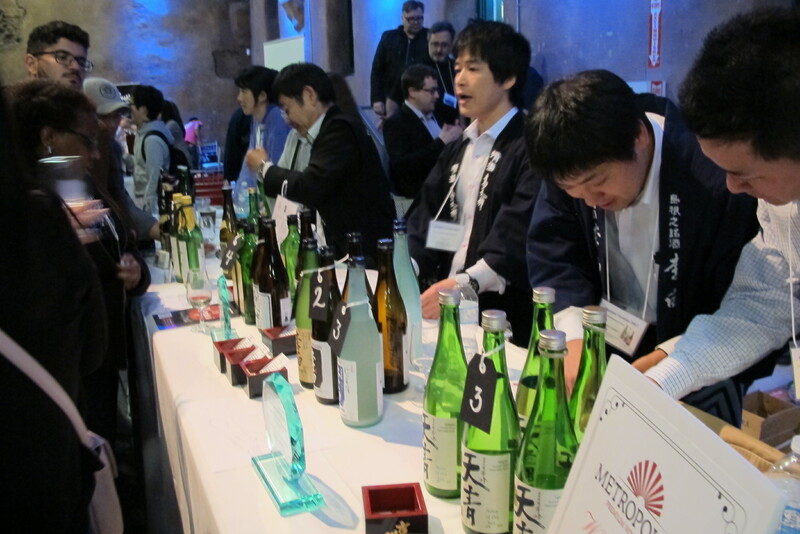 This is the largest sake tasting festival of its kind in Canada. In 2017, the Festival celebrates its 6 years of promoting sake in Toronto. Fermenting Cellar, the event venue, is a historical building originally constructed in 1859, first opened in 1861 – 6 years prior to Canadian Confederation. Today, it has became Distillery District’s flagship building. Festival of Sake was held on June 1, 2017. The doors were open to the public at 6:30pm; nevertheless, people were seen queuing outside the limestone building soon after 6pm. The waiting participants were not only local Torontonians, but also international tourists from Hong Kong and other countries. Stepping into Fermenting Cellar, I could see a packed crowd filled the 7500 square feet venue. Blue lights shone up on the classic timber beams and trusses. As I pre-registered for the Introductory Tasting Package, I was eligible to get 20 “Tasting Tickets” at the entrance counter. Those tickets were used as “money” to buy sake and food. No cash or credit cards were taken by exhibitors. Wine glasses were supplied by the organizer, all clear white. One could easily see the color of sake through the glasses and smell the aroma. This year, the event showcased 150 different sakes from Japan, Canada and the US. Meeting sake vendors and professionals was regarded as added value to this kind of event. Participants were free to ask questions, in English or Japanese, and they could get the answers promptly. There were world’s top sake products available for tasting. Some brands were not carried by LCBO stores, but the public could purchase them through private order with importers or brewers. Junmai, Honjozo, Ginjo, Ume were the grades and categories expected to be present at The Festival. Besides those, what I found this event quite unusual but most interesting is to see how the Hakutsuru Sayuri nigori sake was mixed with other ingredients , such as Crabbies Ginger beer, cucumber, lime, pandan and cilantro, to become cocktail. The brewer demonstrated here how to make a greenish cloudy cocktail, which taste could be challenging to some people’s taste buds but mine worked well. To accompany the great sake were appetizer style dishes prepared by 11 restaurants. Some were Toronto’s top local Japanese and contemporary restaurants which proudly showcased a wide selection of tasting items. One impressed me much was the Hokkaido Scallop Sashimi with Uni Cream Sauce. Size of one scoop could fill my mouth with sweetness and freshness, paired well with Ginjo. Tiny hamburgers, raw oysters, western desserts were available as well. Since sake is very low in bitterness and acidity; also most sakes have some sweetness and are not especially fruity; therefore sake rarely clashes with any cuisine. In this evening, I had the pleasure of enjoying western food and Japanese rice wine married in harmony. The Festival was estimated to have 700 people attended. The centuries-old tradition of Japanese drumming was brought to the venue as a way to celebrate the Japanese culture.